British Infantry Tank Churchill III - This is a real blueprint made directly from vellum masters. Delivered to you on a full size master sheet measuring 42"x 30". The blueprint will arrive uncut, edge not slit, or trimmed, and are marked for proper 36"x24" finishing. 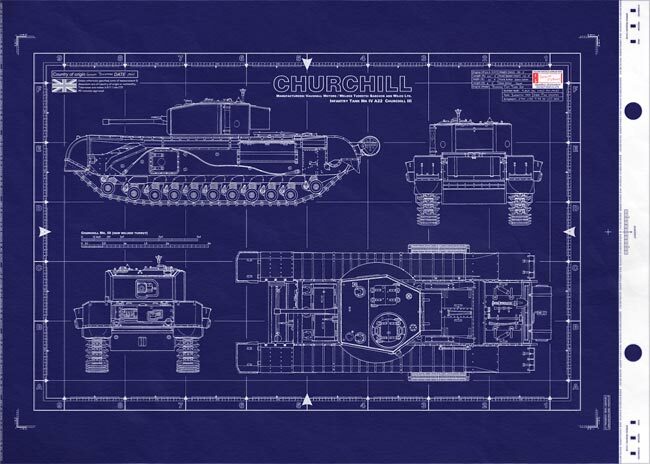 This is a detailed general arrangement plan (standard blueprint cover-sheet) of the Churchill III Infantry Tank, a series of tanks named after Winston Churchill. The blueprint will arrive uncut, edge not slit, or trimmed, and are marked for proper 36"x24" finishing. 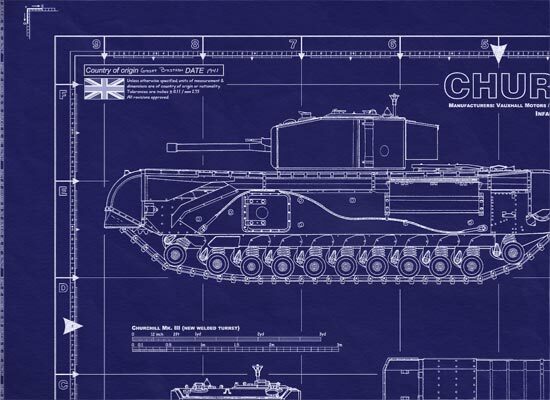 This is a detailed general arrangement plan ( standard blueprint cover-sheet ) of the Churchill III Infantry Tank, a series of tanks named after Winston Churchill. Known as the Churchill after the famed British Prime Minister Winston Churchill. The Churchill was a heavy British infantry tank used during World War II, and it is best known for its heavy armor, large longitudinal chassis with all-around tracks with multiple bogies. By 1941 most of the other nations ? Germany, the Soviet Union, and the US - had gone to three basic tank types: light, medium and heavy. But the British stuck to three other types: light, infantry, and cruiser. Infantry tanks were slow but heavily armed and were designed to support infantry; cruiser tanks were fast, armed with what appeared to be powerful antitank guns, and were designed to combat other tanks. The Churchill was one of the most modified and successful British tanks of World War II. Some variants of the tank were used for many years after the end of WWII. The design grew out of the development program for the A20 tank. The A20 was designed for trench warfare which the prevailing minds of 1939 Britain thought would be the likely form of combat. The design of the A20 was modified by Vauxhall Motors and the A22 was born, which led to the Infantry Tank Mk IV, later christened the Churchill. The British believed that the threat of invasion was imminent and as a consequence the Churchill was rushed into production. The Tank, Infantry, Mk IV (A22) was a heavy British infantry tank used in the Second World War, best known for its heavy armour, large longitudinal chassis with all-around tracks with multiple bogies. It was one of the heaviest allied tanks of the war. The III was the first major armament overhaul of the series, eliminating the hull howitzer and equipping the tank with a more powerful 6 pounder gun. Unlike early versions, it had a welded turret. This series of tanks was named after Winston Churchill, who was Prime Minister of the United Kingdom and Minister of Defense at the time, and had been involved with the development of the tank as a weapon during the First World War. Photo right: Churchill, the last and probably the most important of the British Second World War Infantry tanks. With France conquered, the scenario of trench warfare in Northern Europe was no longer applicable and the design was revised by Dr. H.E. Merritt, Director of Tank Design at Woolwich Arsenal, based on the combat witnessed in Poland and France. These new specifications, for the A22 or Infantry Tank Mark IV, were given to Vauxhall in June 1940. With German invasion looking imminent and the United Kingdom having lost most of its military vehicles in the evacuation from France, the War Office specified that the A22 had to enter production within the year. 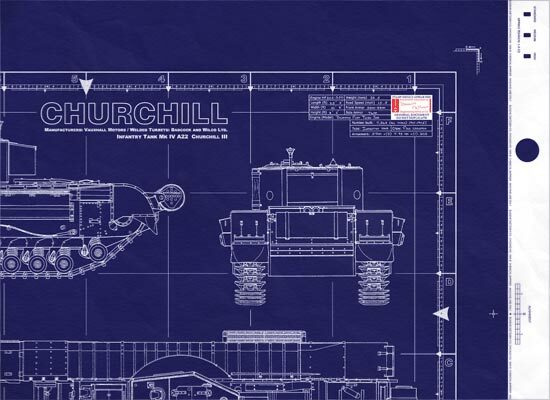 By July 1940 the design was complete and by December of that year the first prototypes were completed; in June 1941, almost exactly a year as specified, the first Churchill tanks began rolling off the production line. This hasty development had not come without cost though, as there had been little in the way of testing and the Churchill was initially plagued with mechanical faults. Most apparent was that the Churchill's engine was underpowered and unreliable, and difficult to access for servicing. Another serious shortcoming was the tank's weak armament, the 2 pounder (40 mm) gun, which was improved by the addition of a 3 inch howitzer in the hull (the Mk IICS had the howitzer in the turret) to deliver an HE shell albeit not on a howitzers usual high trajectory. These flaws contributed to the tank's poor performance in its first use in combat, the disastrous Dieppe Raid in August, 1942. Frantically working to produce the A22, Vauxhall designed a tank that sacrificed appearance for practicality. Powered by Bedford twin-six gasoline engines, the A22 Churchill was the first tank to utilize the Merritt-Brown gear box. This allowed the tank to be steered by changing the relative speeds of its tracks. Production of a turret to carry the QF 6 pounder gun began in 1941 but problems with the plate used in an all-welded design led to an alternative cast turret also being produced. These formed the distinction between Mark III and Mark IV. The poor performance of the Churchill nearly caused production to be ceased in favor of the upcoming Cromwell tank; it was saved by the production of the much improved Mk III which appeared in March 1942 and was first used in the Second Battle of El Alamein in October of that year. In the following Tunisia and Italian campaigns, the Churchill Mk III and its immediate successors continued to prove their usefulness. There were many mechanical improvements, and the Mk III used the 6 pounder (57 mm) gun in a new turret design. In one encounter the updated Churchill tank even eliminated a heavy German Tiger I tank; the 'kill' was achieved by the 6 pounder shot becoming lodged between the Tiger's turret and turret ring. The crew abandoned the Tiger, which was subsequently captured by the British. This particular tank is on display at Bovington Tank Museum in the United Kingdom. The Churchill was notable for its versatility and was utilized in numerous specialist roles. Additionally, in tests conducted in the Madang by the Australian Army in mid-1944, at the request of Britain's War Office, the Churchill was tested against the M4 Sherman and found it to be, overall, a superior tank for jungle warfare. The tank remained in the service of the British Army until 1952 with one, a bridge-layer, remaining in service well into the 1970s..
Mk I had a 2 Pounder Gun in the turret and a 3 inch Howitzer in the front of the tank?s hull. Mk V had a 95mm Howitzer instead of the MK IV?s 6 Pounder. MK VI had a British 75mm dual purpose gun instead of the Mk IV?s 6 Pounder. The Churchill first saw action during the ill-fated Dieppe Raid of August 1942. The raid was a disaster; the Churchill tanks that landed on the beach couldn?t climb the steep shingle or beach front walls and were either knocked out or abandoned. After being upgraded, they later saw action in the Middle East and 6 were used during the 2nd Battle of El-Alamein where they were found to be immune to enemy anti-tank fire! They also went on to serve with distinction in Tunisia, being perfectly suited to the hilly terrain. The Churchill saw service throughout the rest of the war, in both the Italian and North West European Campaigns. One issue that did arise with the Mk. VII was that it was underpowered. Though the tank had been built larger and heavier, its engines were not updated which further reduced the Churchill's already slow speed. Serving with British forces during the campaign in northern Europe, the A22F, with its thick armor, was one of the few Allied tanks that could stand up to German Panther and Tiger tanks, though it's weaker armament meant that it had difficulty defeating them. Despite its early defects the Churchill evolved into one of the key British tanks of the war. It was the first British tank to mount US 2.95 inch (75 mm) guns after guns and mantlets were salvaged from Sherman tanks that were knocked out in Tunisia.. It could be stated that the British Churchill series tank was the most important British tank of the Second World War. Built in numbers second only to the Valentine, the Churchill was designed to replace the aging Matildas. 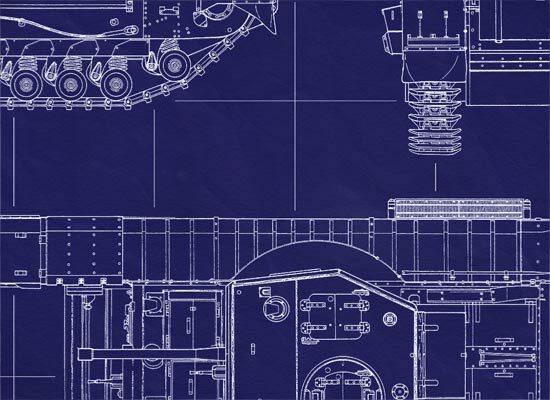 Reminiscent of tank design doctrine of the First World War, the Churchill was a heavy, plodding weapon system in a time when tank design was finally coming into its own. The chassis was so adaptable that a multitude of variants existed to the time the war ended and well up to 1965, when the last Churchill AVRE vehicle was at last retired. United Kingdom forces fighting in Korea also employed the Churchill Infantry tank. Most of the variants used in Korea were of the Mk III designation. The Churchill's armour was extremely thick for the period, over 100mm thick at the front and 76mm sides on the Mk I which would have posed a very difficult target for any German tank or anti-tank gunner. The hull consisted of machinable armour on a milled steel frame, this allowed production to be easier, the turret was usually cast although in later versions it was also machinable armour. The machinable armour plus milled steel armour configuration offered slightly less ballistic resistance to a single machinable plate but the milled steel plate offered better protection against non penetrating rounds. The biggest change in armour came in the Mk VII version when frontal armour was increased to up to 152mm and sides 95mm, Mk III - VI versions also had additional armour added to the front and sides of the tank. Churchill tanks first saw action at Dieppe where MkI, II, and III tanks were used. Performance was not great as they struggled to get off the beach - it must be remember that all tanks would have probably suffered the same fate. A number of vehicles were sent to North Africa where performance was much better, the tanks thick armour and ability to climb extremely steep hills was put to good use. In fact it was the Churchill's performance in Tunisia that kept the tanks in production as the project had been scheduled to end in 1943. Slightly armed compared to German tanks, it owes its major role in the British army to its thick armor. was produced in Many Variants of the standard Gun tank plus it was adapted in a wide range of specialist armoured engineering roles. Over 7000 ( all years and variants ) Churchill tanks were produced, and as an infantry tank, it was second to none.